5793 labyrinths found. Showing 1281-1300. Sorted by country, state, city, then zip/postal code. Follow Route 62 from Barrydale towards Ladismith for app 13 kms, turn right at the Magic Mountains Retreat road sign onto a gravel road, Lemoenshoek Road; Parking on the right for Magic Mountains Day Visitors, walk through the gate, past the Peace Pagoda, follow the labyrinth sign over the dam wall. 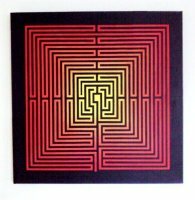 SkyLabyrinth is the worlds first 3D labyrinth where the pathway inclines from the start till the labyrinth center. SkyLabyrinth is located over the energetic heart centre of Stonehenge Nature Reserve and its energy is enhanced by a massive rose quartz crystal suspended at its heart space. 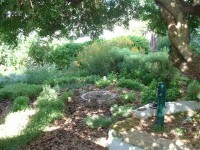 The labyrinth is located in a private garden. It is mainly used by the family and clients of the owner, who is a certified life coach and labyrinth facilitator. Other interested walkers are welcome. Please call to arrange. From Cape Town, come over Ou Kaapse Weg to Noordhoek. Take a right towards Chapman's Peak Toll Gate. Turn right at Noordhoek Farm Village, and left into De Goede Hoop Estate. Phone first or the security guard will not let you in. Contemporary-classical with medicine wheel at the center, this labyrinth has a circle and Y as seed-forms. It is made of rock and indigenous medicine plants. Designed to coincide with the rise of feminine conciousness and the rare 2004-2012 Venus/Sun transit, the walk to the goal and back shows your role in this transition. Crescent Shaped Labyrinth with beautiful rock moongate. A nine path circuit labyrinth made from sandstone edges retrieved from the same location that the Church sandstone were carved 70 years ago. The circuit is filled with pinewood chips from forests nearby and a pin oak tree planted in the center. Aerial view of our labyrinth three months after it was built. It now has more plants separating the pathways. Labyrinth at Mofam River Lodge. At Mofam River Lodge we host a lot of weddings which then means the venue is closed to the public, thus, I suggest you give us a call - if the venue is open, you are welcome to come and enjoy our piece of paradise! 34 13.701S° Lat. ; 18 59.305E° Long. Directions to Antbear Lodge / Retreat Center from Johannesburg. Exit N3 at 2nd Estcourt turn off (175) signposted Wembezi. Turn right and cross over the N3. After 500 meters turn left onto a dirt road signposted Zulu Waters / Moor Park. Travel for approx. 8 km. At the Y-junction take the left fork signposted Zulu Waters / Moor Park. Continue on this road for 15km. The Lodge is on the left signposted Antbear Guest House 5 km after you cross the metal bridge. Drive up the farm road for 2 km. See our website for further directions. 10km off the N3 towards Giants Castle, 4.5 hours from Johannesburg and 2 hours from Durban. See website for directions, and please call ahead if you plan to visit. 26 0’ 48.37° Lat. ; 27 35’ 43.02° Long. Round 7 Circuit Classical Labyrinth with a 6 petal Rosetta. S34 02.049'° Lat. ; E19 22.825'° Long. 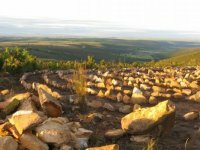 Nature's Own 11 rock Labyrinth is situation in the hearth of the Cradle of Humankind, Hartbeespoortdam, North West, Gauteng surrounded by awesome nature, peace and tranquillity. 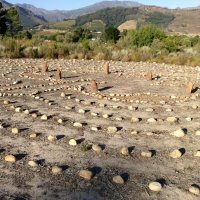 We also have Healing Days when groups come and first walk Labyrinth whereafter I give them a Yoga class, breathing exercises and relaxation. We supply light vegetarian snacks, herbal teas, fruit juices and clear mountain water. People also bring along their own picnic baskets. People just love this country spiritual outing. 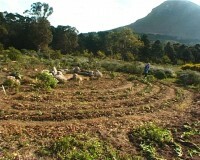 This labyrinth is located at the Towerland Wilderness, which is situated near the village of Herbertsdale.